1. Starter dough : Mix bread flour, yeast and water until well combined. Leave it to rest for an hr (or until double in size). 2. 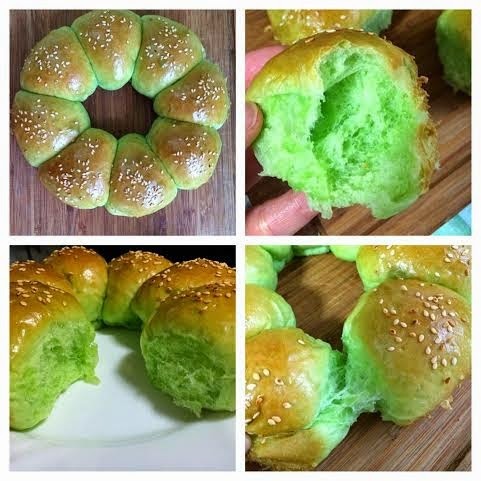 In bread maker, put in pandan water, coconut milk, pandan paste, yolks, sugar, salt, bread flour, yeast. Let machine knead for 2 mins (until the ingredients are well combined) add the starter dough in small pieces. Let machine knead for another 2 mins then add butter. Let machine does the kneading and proofing job for 1.5hrs. 3. At the end of the program , divide the dough into 25g each. Flour your hands and shape them into a ball and place them 2-3cm apart on a baking pan. Make sure u grease the pan otherwise it will stick to your pan and u will tear the buns trying to pull it out. 4. Leave to rise in a warm place for an hour. 5. Apply milk-wash, sprinkle sesame seeds and bake for 18-20 min @ 170c until risen and golden.